How is Mantri Realty Offering 100% Return in Three Years? How can Mantri guarantee returns? And 100% in three years? This is like spitting on the face of SEBI which regulates that no one can guarantee investment returns in India unless they are a financially regulated entity, and Mantri is not. Let’s assume this is true. What’s in it for Mantri? They get money at a way lower rate (10% or so) because the loan is given to you, not them, and they pay only the interest. The extra 20% that they pay if they honour their “guarantee” amounts to about 6% a year. That’s an effective rate of 16% a year – which is perhaps less than they can get from the market. What’s in it for you? If you trust that Mantri will do what they say, then it’s a sweet deal. Builders have clauses like if they don’t finish on time, they pay you a penalty. But many simply refuse to pay any penalty, and threaten to derail the handover process if you insist. You don’t have much leeway. Given this, would you expect them to honour their 120% guarantee? If the market price after three years hasn’t gone up, it is quite likely that the buyback “guarantee” suddenly vanishes and you are asked to come back after a month or such. If they delay you for a year, you might settle for just your money back! And then if they don’t pay the bank the interest on the loan, then you are liable. Any default is your problem and goes on your record, not Mantri’s. Eventually if they have to abandon the property for any reason, including litigation, you’re going to be left holding the bag. 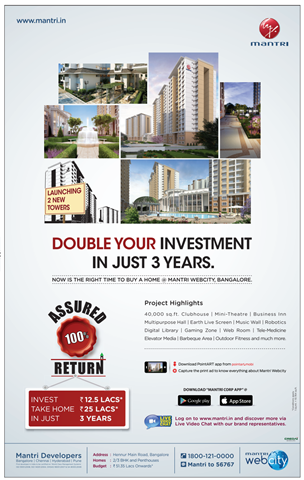 And of course, consider that the property is in Bangalore, and they placed this full page advertisement in Times of India, Mumbai, but not in TOI Bangalore. If you’re going to ask me if this is still worthwhile, then I’m really in the wrong business and I should be selling property. We need a real estate regulator who can ban these kind of offers, or if offered, enforce them forcefully. RBI needs to take notice and understand that such loans are not being taken by the individual, but by the builder, and ask banks to reprice them accordingly.